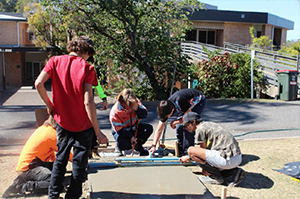 The Rockhampton Flexible learning Center (FLC) commenced in 2014 as a mobile program and then as a registered secondary school in the Edmund Rice tradition in 2015 to support the community in providing education to young people who are disengaged from education. The journey since 2015 has been to develop a curriculum that is appropriate, responsive and relative to the needs of the YP. It has also seen the development a school culture where the YP can take pride in their school, feel accepted, reflect, heal, and move forward in their education. In this short period, the school has grown both in the number of YP that attend and the staff employed. Initially there were approximately 50 enrolled in 2015, which has grown to 70 at the end of 2017. The growth has been slow and steady to allow time for the school to gain momentum and settle as a school. YP who attend RFLC come from Rockhampton, Mount Morgan, Yeppoon and a significant number from Gracemere. The school operates three buses to pick up and drop off the YP each day. Currently over 50% of the YP are indigenous. It is important therefore that we have focused on ensuring that cultural understandings and experiences are a part of the school’s programs. Initially, the school went through a smoking ceremony by Uncle Bill Mann, traditional owner and local Elder for Darumbal. 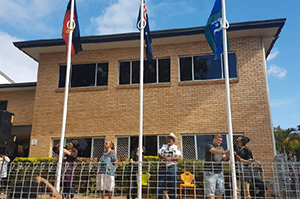 Included in the ceremony was the official opening of the school’s yarning circle which was designed by one of the YP who previously attended the school. The school operates within a set of four principles: Respect, Participation, Honesty and Safe and Legal. All conversations, negotiations and behaviours are aligned with these four principles, allowing YP to learn to govern themselves within this framework. Staff are also expected to work within this framework ensuring that our way of operating with the YP is on common ground. The Rockhampton FLC offers holistic learning options for young people who have been disengaged from normal education settings. Focusing on the social and emotional well-being is a large part of the work we do with the assistance of many organisations within the school’s local community. As educating YP is our core work, the school has worked closely with other education and training organisations to assist in delivering learning programs so that the YP can access potential work options in their futures. This includes a range of NGOs, RTOs, local health services, local indigenous services, and other government organisations. We provide a range of learning options to support learning for the YP. 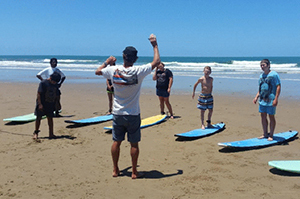 These range from health and wellbeing programs, cultural programs, accredited learning programs, outdoor adventure based learning experiences, and core literacy and numeracy programs. One of our primary aims is to ensure that the YP have an adequate foundational learning base on which they can secure employment beyond school. This includes the necessary life skills that will assist them to be a positive, contributing citizen in their local community. Staff adapt learning to meet the individual needs of the YP. Placement in classes is determined around these needs and their social capacities. It is common to see a broad age range within any given learning group. Learning groups are small. A teacher and a youth worker form the teaching and learning team for each group. 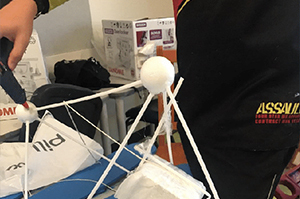 There are four learning groups: a junior group, a manual arts group, a senior learning group and a ‘bounce’ group – so called to cater for the bouncy nature of the YP who need a mobile component to their learning when they struggle to remain within the classrooms walls. The school is focusing its efforts toward supporting YP to experience outdoor education opportunities, as this is often where the YP start to find themselves. Overnight camps are offered throughout the year culminating in a four-day camp at Carnarvon Gorge. In addition there is a push to engage YP in VET courses in areas where they have an interest. By doing so, employment pathways can be created that they might otherwise not have access to. Providing work experience opportunities for YP is another area in which the school assists YP to prepare to transition from school to work.